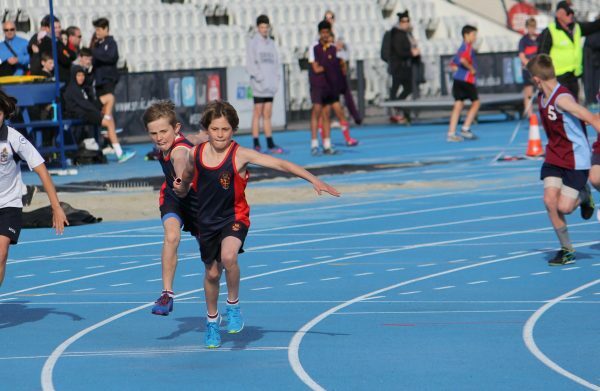 Anticipation built towards the State Athletics Championships as all three Junior School 4 x 100m relay teams had qualified to compete. 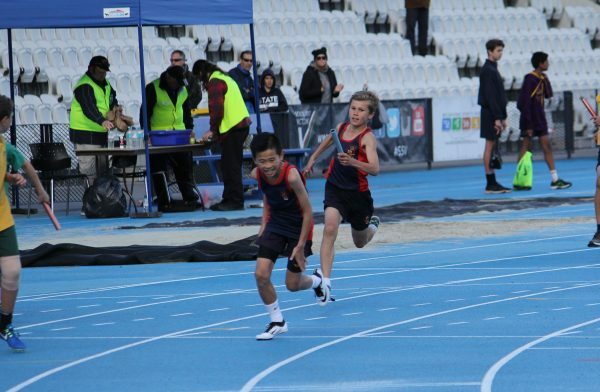 With all the training and preparation complete, it was now time to head to Lakeside Stadium for the biggest day on the School Sport Victoria Primary calendar. In the heats, the 10 Years team showed they were the team to beat. With seamless baton changes, they cruised home to qualify fastest for the final. The 11 Years team also ran well, but weren’t quite as sharp with their changes and qualified second by a narrow margin. The 12/13 Years team, despite an obvious size disadvantage, ran third in their heat, but were the third fastest qualifier for the final. With a four-hour gap between the heats and the finals, the boys were focused on resting up, staying relaxed and making sure they were ready. The 10 Years boys again ran brilliantly and, with unbelievable baton changes, charged home to win the Gold Medal by almost a second. Jake Ring, Harrison Gibbins, Seb Naccarella, Edward Mitrevski and Luke Sexton (reserve) handled the pressure of their first SSV State Athletics Championships without a hiccough. The 11 Years team had their work cut out, but knew they were a chance for Gold, if they could achieve clean baton changes. The ever-so-slight improvements in their changes from the heat took them to the lead and they were able to clinch the Gold in an incredible race. Cade Segar, Harry George, Elden Zeng, Will Stretch and Hugo Richey (reserve) combined composure with pure aggression to claim their first SSV State Athletics Gold Medal. The 12/13 Years team looked like boys among men. With this age group spanning two years, the difference in size and strength between some of the competitors is stark. Justin Krok, Oliver Goodger, Matthew Hogg, Brayden Hope and Sam Heron (reserve) were thrilled to pull off an amazing run and claim the Bronze in an extremely fast final. All boys should be congratulated on their efforts in preparing themselves for these events. Months of training culminated in the boys performing at their best. Special thanks to Year 7 boys Alex Holman, Zach Bowen, Jonah Campigli and James Bourke, who assisted in coaching the boys and also came to support them on the day.